Followers of Jesus… do you reflect Jesus to a world that desperately needs Him? What important lesson does this Bible passage teach us? Answer: The passage teaches that our spirit is totally connected and dependent on God's Spirit. It is only in God's Spirit that our spirit lives and moves and acts. Consequently everything we say, think and do, God knows immediately. Know that you live, move and have your being in the presence of Jesus. He sees everything you do; Jesus is actually there with you. You can sense His closeness and are happy Jesus is near. Imagine Our Lord's sadness and disappointment when we sin. Picture His happiness and joy when we reject sin. 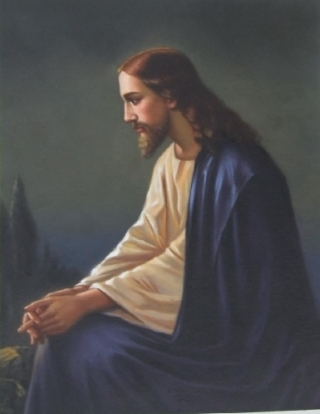 During the day frequently repeat the name, "Jesus". He will bless you, guide you, and rescue you from temptation. Some people, when they first hear Jesus, listen to His word and follow Him. Later, they tire of keeping His commandments and they neglect His teachings. Now they risk losing heaven and eternal happiness with Jesus. We need to pray each day and to avoid sin, so this will not happen to us. 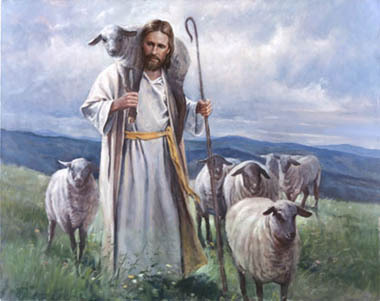 People have many different images of Jesus in their minds: Jesus nailed to the Cross… or Jesus the good shepherd. Prayer seems more real if you have a mental picture of Jesus. Friends tell me that religion doesn’t matter if you are doing good, being kind and living a good moral life. But Saint Paul says this is what every decent person should do. Jesus offers us so much more than what He asks from us. He offers His faithful followers a changed and radiant life and a peace and joy that the world cannot give. He offers a friendship and love beyond all understanding. And a life after death “such that eye has not seen, nor ear heard, nor has it entered into the heart of man what God has prepared for those who love Him." When you are close to Jesus, you are aware of His presence in your daily life. Wherever you are, whatever you do, Jesus is there with you. Jesus, I praise you, I thank you, and I love you. or... Jesus I thank you for watching over me.